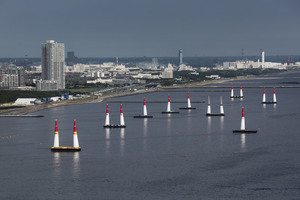 The skies above Chiba will once again become a motorsports battleground, when the home of the Samurai welcomes back the Red Bull Air Race for the fourth time. The sprawling metropolis of Chiba is renowned as the birthplace of civil aviation in Japan and will host the sport again on 26-27 May. Join us! Le Vot collecting a number of mid-field results in Chiba. He's a really skilled pilot with some fantastic, intuitive flying, but has struggled again with his raceplane setup. Le Vot was heading for a third place finish so far, and it's a pylon hit for the French pilot who will be GUTTED with that performance... he knows he's capable of so much more! Velarde now into the track... he's in the chase and looking more settled and smoother out there compared to his FP sessions... he goes gunning for the Finish Gate though after pulling some clean VTMs and getting more speed out of the engine... that's 56.840 for the Spanish pilot. He's capable of being super competitive and will have the confidence to push through this second Run, very tight turns and wings level through the Gates, he's on the final sprint for the Finish Gate. We wait with baited breath as it's under review... and it looks like Velarde has to make do with 2nd place as he picks up +2s at Gate 11... that would have been a top spot, but he'll have no choice but to take it and move on tomorrow. Still, a great performance from Velarde and he'll be watching the timings with interest from the Race Airport. GBR's Ben Murphy next up... he's in his inaugural season here in the Red Bull Air Race World Championship Master Class and it's been a real learning curve for the British pilot. That's +2s extra for Murphy at Gate 11... Murphy pulling too hard and losing time in the track... his current time places him at 7th out of 7 pilots that have flown. France's Brageot heads into the track for his first Run of Qualifying here in Chiba. He's been lacking in pace and looking less confident over the ocean, only managing 12th and 13th places in his Free Practice sessions. Gate 6 strikes again as Brageot picks up a penalty in the Air Gate for Incorrect Level Flying. The wind has swung around from the NE, a different approach in the track today... could that be catching the pilots out? Only Kopfstein, Bolton and Ivanoff have managed two clean track runs so far today in Qualifying... but Brageot is looking tired and not on form... he's picking it up though and Brageot suddenly looking more in control as he finds some great pace in that last, hard long path to the Finish Gate. That's a great finish... it's made all the difference for the French pilot who moves up to 3rd place overall so far. USA's Kirby Chambliss cleared into the track. He picks up +2s through Gate 7 as he pitches and climbs, putting more pressure on the US pilot to gain back some of that time in the track. He's pulling really hard through the chicane and isn't quite finding the precision through subsequent Gates. The splits are going green and he goes FULL THROTTLE with a significant margin as he finishes with 56.058, over half a second faster than McLeod. 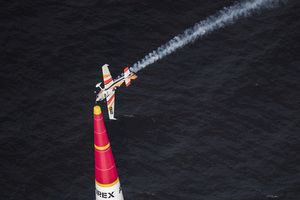 Chambliss has thrown down the gauntlet and Martin Sonka is next up to try and take the top spot from his fellow Master Class pilot. Sonka has struggled this season, with disappointment from the last two races... he's managed a best finish of 3rd in the standings in FP... he looks a little conservative out there, maybe biding his time and just trying to get through the track cleanly before he really tests himself. It's a 57.005 for Run 1, and Sonka is cleared into the track... but he's picked up a penalty already in Run 2 by exceeding the speed limit on the Start Gate with 201kts... this is all about precision and that penalty will push him right down the standings. So it's got to be all about putting in a great net time and using this is an opportunity to refine those lines. Sonka looks comfortable and again, it's a learning experience. Disappointing, but not a write-off for the Czech pilot. Run 2 with the extra penalty earns him 57.218, so it's the Run 1 time that will seed Sonka. The winds have been challenging... offshore, there's not a lot of turbulence... but it makes the track unpredictable. The conditions have been steady today, I've just been playing with how much risk I want to take. Anything can happen out there... my line's not perfect... it could be good enough to compete for the win. Dolderer has a real ability to go fast and clean, and he really enjoys it... he'll be pushing hard for a great finish to earn him a strong position in the Round of 14 tomorrow. Dolderer looks fresh and comfortable, he goes cleanly through the track and it's a great start for the German pilot who is full of energy and will attack that second Run to take the top spot from Chambliss.